Complete parquet plank finishing solution. Smartparquet is the modular solution for finishing parquet planks (up to 600 mm wide), ideal for applying natural oils, UV oils and coats, urethane oils, traditional waxes, stains and colouring products. Application: with single or double roller. Wiping: with rotary pads and/or bristle and abrasive strip wiping brushes, to aid penetration of the product into the plank. Curing: by UV-R oven with one or more single-lamp units depending on the coating's reactivity characteristics and the type of process (gelation or complete curing). Both versions have control board with touch-screen display and user-friendly interface. 300 mm: modular solution, with monobloc workpiece conveyor system, which can be equipped with all technologies required to finish parquet planks up to 300 mm wide. 600 mm: modular solution subdivided into separate units, which can be equipped with all technologies required to finish parquet planks up to 600 mm wide. Complete with One-Step quick-extraction brushes and rollers. Extremely modular and flexible in relation to working cycles. It is available in two versions, of 300 and 600 mm, for wider parquet planks. Capable of performing all processing phases – application, wiping and curing – in a small space. 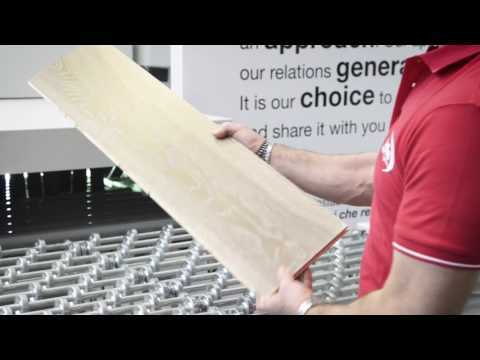 Smartparquet 600 mm is the latest-generation, modular unit solution for processing parquet planks up to 600 mm wide, for which there is now strong market demand.